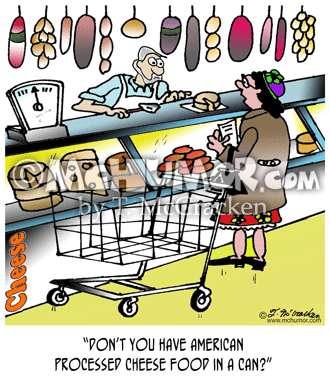 Dairy Cartoon 3412: Someone in a fancy cheese store asking, "Don't you have American processed cheese food in a can?" 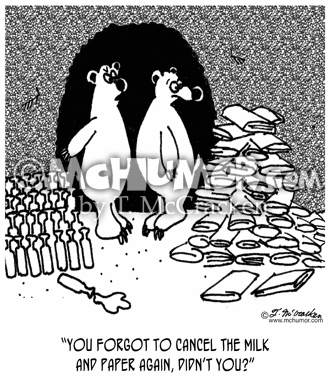 Dairy Cartoon 3228: While looking outside a cave at a stack of papers and milk, a bear says to her mate, "You forgot to cancel the milk and paper again, didn’t you?" 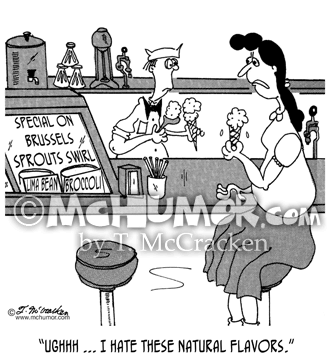 Dairy Cartoon 5175: Kid in ice cream parlor eating a cone of Brussels Sprouts Swirl grimacing and saying, "Ughhh ... I hate these natural flavors." 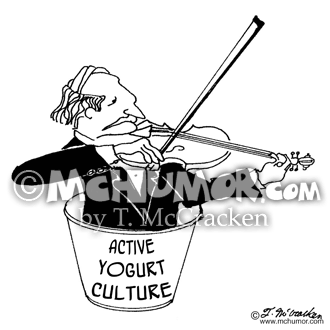 Yogurt Cartoon 0615: "Active Yogurt Culture." A violinist plays in a yogurt carton. 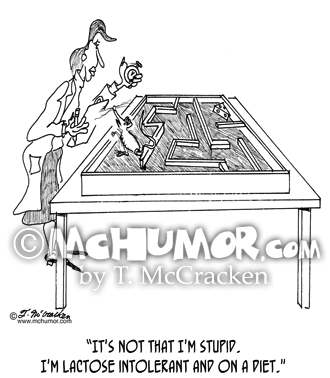 Lactose Cartoon 1525: A lab rat in a maze says to a scientist with a stopwatch, "It's not that I'm stupid. 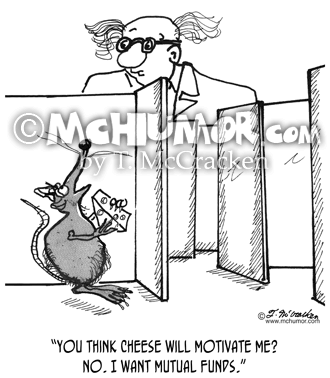 I'm lactose intolerant and on a diet." 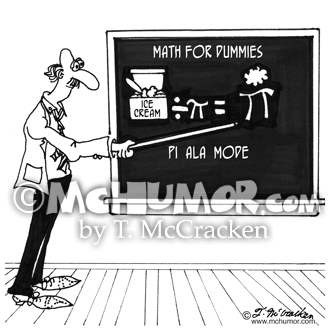 Math Cartoon 5850: A professor of "Math For Dummies" shows on a blackboard a scoop of ice cream over the Greek letter, pi ( ) thus creating, "Pi Ala Mode." 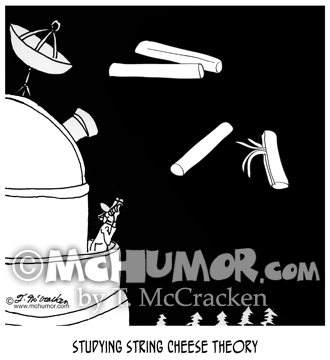 Physics Cartoon 8798: "Studying String Cheese Theory." An astronomer looks at huge cheese balls in space. 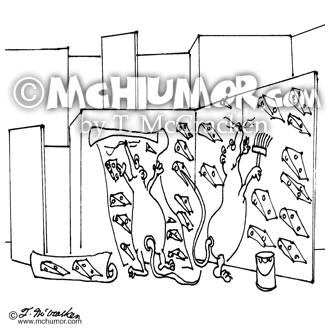 Lab Cartoon 6097: Mice in lab maze paper the walls with wallpaper that has pictures of cheese on it. 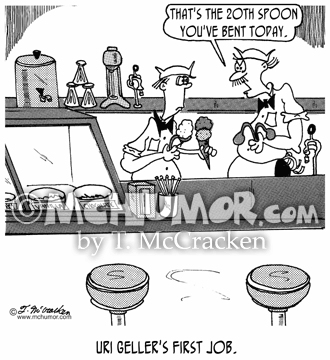 Ice Cream Cartoon 4928: "Uri Geller's First Job." 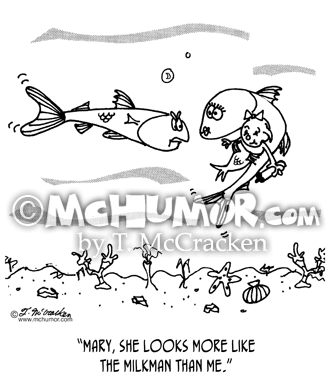 At an ice cream parlor with a lot of a bent scoops a manager says to a boy, "That's the 20th spoon you've bent today."